This post originally appeared as a guest post I did for Playdough to Plato. Becoming a proficient reader involves practice, practice, practice. Every reader needs text to practice their growing literacy skills. 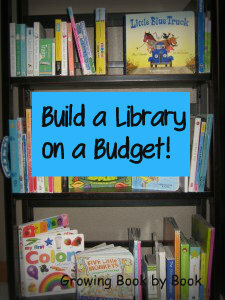 Building a library can be expensive, but it doesn’t have to be! 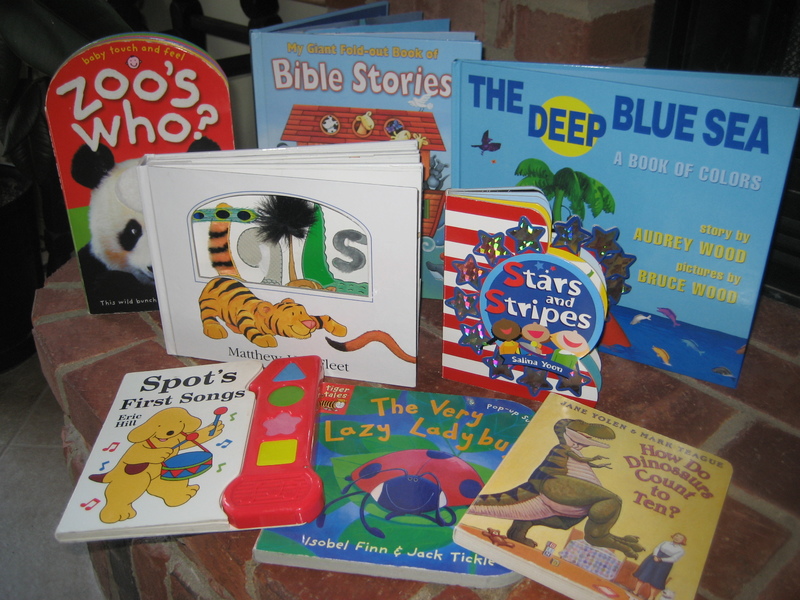 Let’s look at some inexpensive ideas for collecting a wide variety of books. Many libraries, schools and community organizations hold book fairs throughout the year. These sales often sell used children’s books for $.25 to a $1. Last summer, our local middle school was holding a book fair to raise money for their band program. I spent $5.25 and walked away with 15 books! The Book Sale Finder website will help you locate fairs/sales in your area. If you are a teacher, librarian or homeschool teacher, then you can also take advantage of the Scholastic Warehouse Sales, where you can acquire new books for up to 80% off the retail price. Sales are held throughout the year in various locations within the United States. Save even more by printing off the online coupon on Scholastic’s website. 8 books for $4 found recently at a yard sale! Beginning in the spring and often lasting until the fall, you can find numerous yard sales in your area. Many times you will find gently used books starting at $.10. I like to find sales in my area on Craigslist. Many people also advertise in local newspapers and by hanging signs in the neighborhood. Thrift shops often carry lots of donated books. This option has always been hit or miss for me. Sometimes I can find some great items, but I often leave empty-handed. The key is to check back often because new items are put out daily. If you are looking for an exact title, then shopping online is a great option. Some of my favorite sites to visit are: Better World Books, Ebay, and Half.com .Craiglist is also good if you aren’t looking for a specific title. Type in “children’s books” in the search bar. A recent search in my community netted 295 matches. This time of year, you will find many retiring teachers posting books for sale. Your child may start to bring home a book order flyer each month this school year. This is another great way to collect new and current books. Items are usually under $5 and for every book ordered, your child’s teacher will earn bonus points to get more books for the classroom. Though these books are new, they usually have a staple binding meaning they tend to fall apart sooner. I highly recommend reinforcing the book spine with clear packing tape before your first read. An added perk for ordering through these flyers is that your child’s teacher earns bonus points to use to buy items for the classroom. Are you looking for a free way to collect books? Do you have books that your child is no longer interested in reading? Hold a book swap party. Invite other families(How about all the families from your child’s class?) over to your house or a local park. For each used book that a family brings, they get to swap it for a different book at the party. For extra fun, have snacks and hold book talks during the event. I hope you enjoy building your child’s library with these ideas. Do you have any other bargain book acquiring ideas? Please share by leaving a comment. Today is the last day to sign up for the GIVEAWAY for 5 board books! Hurry, hurry! These are all great tips, I’ve pinned it. These are simply awesome tips.. Nice.. I do have a home library.. and often pick books from second hand stores or flee markets.. or just about anywhere.. Wish my kids would read as much though..
Second hand stores are great. I love to find a good bargain! We also always do books as birthday and christmas gifts – the kids build their libraries through such gifts, besides I’d rather have a ton of books lying around than toys that aren’t getting touched! We’ve also done book swap birthday parties – instead of having the guests bring a gift, they bring a book from their collection, and the party favors are books we are ready to give to a new family. A great way to change up our home library. And of course there is nothing like regular trips to the library! Thanks for adding this great post to the Cozy book hop! Love your book swap idea as a party favor. Genius! These are great tips, and I’ve used several of them to build our home library! Thanks for sharing with Learning Laboratory!